The Dr. Martens® Vintage 1461 Made In England is a true classic with its handcrafted construction and timeless style. Part of the Made in England Vintage collection and handcrafted by Dr. Martens' Northamptonshire factory cobblers using original construction techniques. Quilon leather upper is made of a thick and full-grain leather with a matte finish andr only gets better with age. Lace-up oxford with fabric laces and tonal eyelets for a secure fit. Features classic Doc's DNA, including grooved heels, heel-loop, and visible yellow stitching. Product measurements were taken using size UK 4 (US Women's 6), width Medium. Please note that measurements may vary by size. 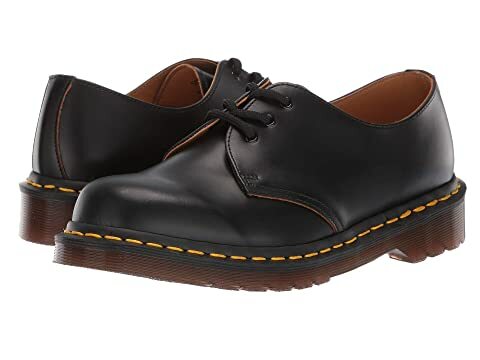 We can't currently find any similar items for the Vintage 1461 Made In England by Dr. Martens. Sorry! I wear them everyday. I get a lot compliments on the style and they are amazingly comfortable. You will not be disappointed. Finally, I have a new pair of Made In England Dr. Martens! I have only been able to find the ones made elsewhere in the world for years, and they don't even compare. I have been desperate for a good pair of shoes. This is what Dr. Martens are supposed to be. Amazing. My all time favorite casual shoe. I wear them almost every day. You do have to be patient with them. as they are very uncomfortable for the first week or two. After that, the soles form a grove to fit your feet and the leather loosens up. After that two week period passes, they feel as if they are made your feet. If you are going to buy real Docs, these are it. The fit and finished is vastly superior to the Asian-made versions. I got theses as complements to the 1460 (8-eyelet), also British-made. Well worth the extra money. I love these shoes. Period. If you read no further, at least read this and spend the extra cash and buy the MIE/Vintage. These shoes are virtually indestructible, and are worth the investment. I got my first pair in college over 15 years ago, and wore them every day and everywhere. Unfortunately, I lost them in a move recently, but they had finally started to look their age, so I just bought another pair a few weeks ago. These seem the same as the originals I had. All of the pairs of DMs that I own are MIE. I can't comment on the MIE/MIC debate that goes on, as I am a purist, and will only buy MIE. Yes, they are more expensive then what I paid for my first pair, or what you will pay for MIC, but it's worth it. I don't think that the break-in period is bad. I have been wearing them to work every other day, and even with thinner &quot;dress&quot; socks, I haven't had a blister. Don't expect them to be slipper-comfortable from minute 1 like Eccos or Born, but once they are fully broken in, you won't wear anything else. Additionally, the cushioning that the soles provide can't be beat. The only complaint I have is that they just don't have the arch support I need. The DM insoles fit pretty well, as you would expect, but for the 1461s, they lift my heel a bit more than I would like, and I do get some rubbing on the heels at that point. I have tried about every major shoe brand around, but I have finally come full circle and anticipate making these my primary shoes again. Hope that helps. Oh, and Zappos has been great, as usual!